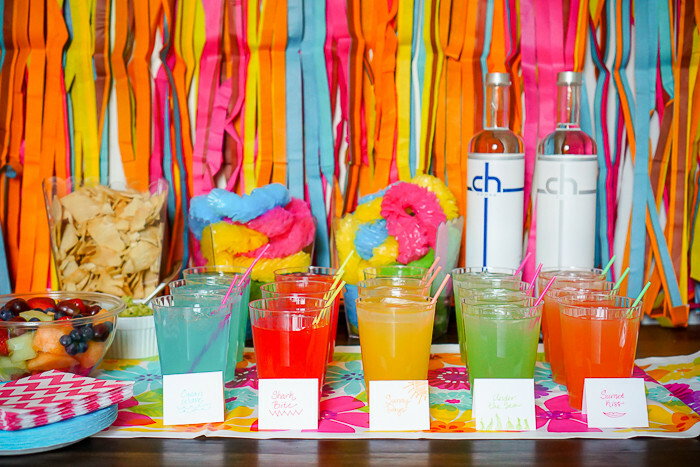 Who is ready to move past bleak winter and head into a colorful summer party?! Two months ago, I shared with all of you 5 Reasons You Should Visit CH Distillery in Chicago! I won’t recap the whole thing because you can easily hop over to read the post, but CH Distillery has great vodka and other spirits, an amazing menu of cocktails and a really cool vibe. It is a must visit! I love the product so much and love supporting hometown businesses that I decided to throw a little taste party for our friends who were interested after Bryan and I talked them up so much. 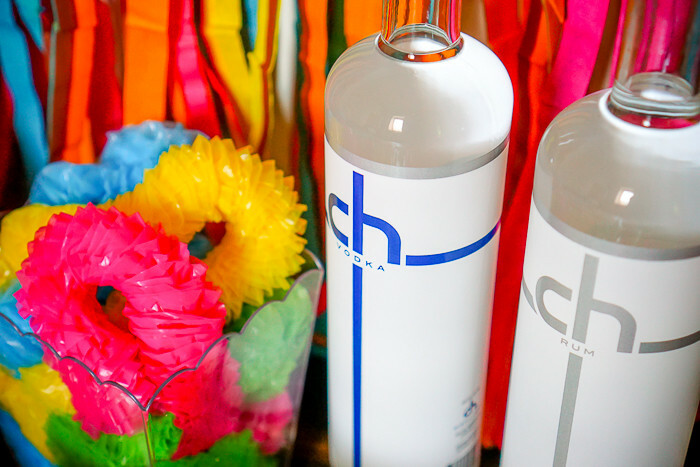 I spent a long time playing around with ideas for this party and what cocktails I wanted to mix up when I finally settled on a Colorful Summer Party with CH Distillery. It has been so dreary here, even snowing in April, that I decided a party to look forward to warmth, summer food, hanging by the pool, and tropical drinks was just the ticket. 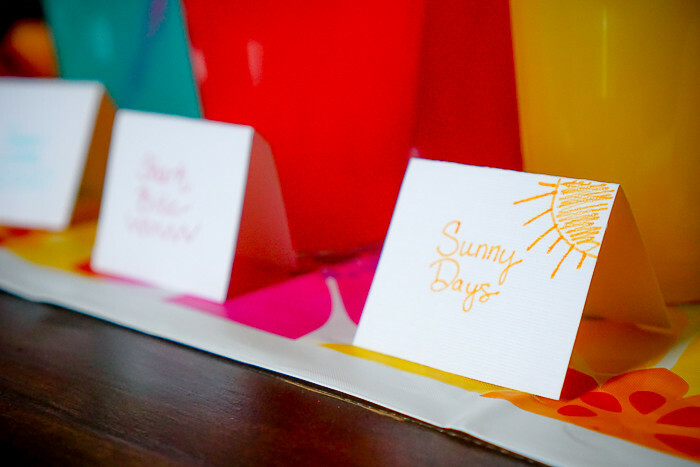 Basically – we went for fun, bright colors! For decor and food, I went very simple – especially since I wanted to offer a good selection of cocktails. I used a colorful grass skirt for the backdrop and found a colorful flower table runner to use. It’s also not a summer party without leis for the guests which also happen to double for fun decor on the table. For food, I went with fresh fruit (fun to also toss into drinks!) 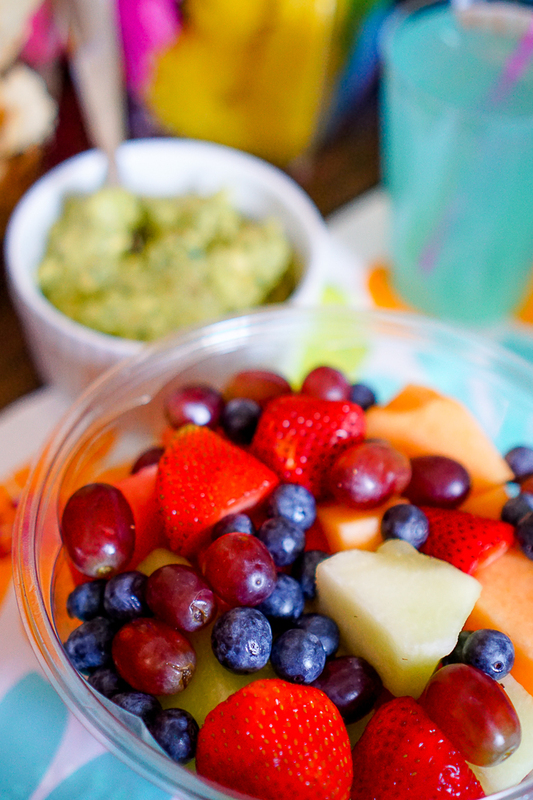 and some guacamole. Having friends over for dinner? Throw some corn on the cob and BBQ chicken on the grill! Easy ideas but always delicious! 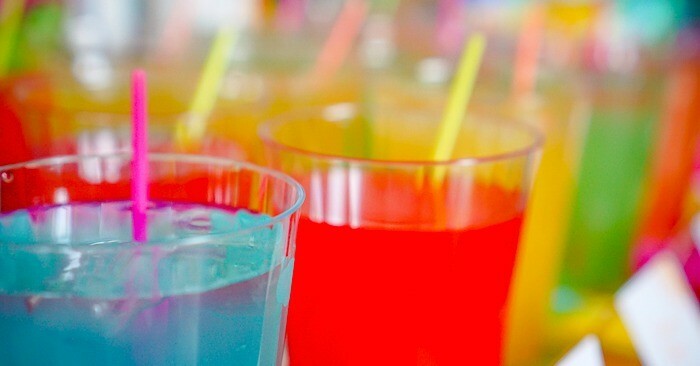 Summer to me is all about fun, fruity flavors for cocktails in bright colors, which is exactly what you will find in these recipes below. Pineapple flavors is a summer favorite of mine, so that is definitely making an appearance below. Combine all ingredients. Shake and then pour into glass to enjoy. Pour ingredients into glass over ice in order listed. Stir all ingredients together. Pour over ice to serve. Mix together! Serve with fresh pineapple chunks if you would like. Add all ingredients to shaker with ice. Pour into glass and enjoy. 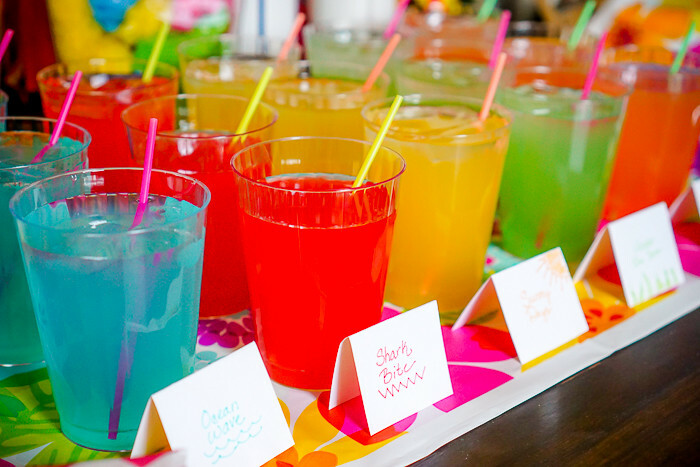 I hope you enjoy these drinks all summer long! I think you are going to love them and CH Distillery Spirits. They have so much to choose from – CH Vodka, CH Peppercorn Vodka (great for a Bloody Mary), CH London Dry Gin, CH Key Gin, CH Bourbon and CH Rum. AND if you live in the Chicago area or will be visiting soon, make sure you check out CH Distillery Events to see what fun things will be happening there!